The economic development of a country depends on research and innovation, research for developing new knowledge in major scientific fields, and research in utilizing the available knowledge for developing new products. Unfortunately, the rank of India in research publications in high impact journals is low, even below that of some third world countries. India’s record of innovative research is not on par with that of developed countries. C.R. Rao Gallery strives to inspire the younger generation into a path of higher education and basic research for the creation of knowledge to place India on the world map of developed countries in the area of basic research. Rao- When I was 11, I could do complicated arithmetical problems without paper and pencil. My father appreciated my interest in mathematics and encouraged me to get a doctorate degree. My father also chose Ramanujan and Nobel Laureate C. V. Raman, two giants in mathematics and science as my role models. Thus, my entry into mathematics resulted from the encouragement I received from my father, my own interest in solving mathematical problems, and my desire to fulfill my father’s wish for me. Rao joined the Indian Statistical Institute (ISI) in 1941 at the age of 20 after obtaining his MA degree in mathematics at the Andhra University. This was the beginning of his long career in statistics, spanning over a period of 70 years. In 1946, Rao was sent by ISI to Cambridge at the request of the Anthropology Department to analyze skeletal data from North Africa collected by the University Museum to determine the origin of the people who lived there. He completed the project work in 1948. During his two year stay in Cambridge, the celebrated statistician R.A. Fisher agreed to be Rao’s thesis advisor for Ph.D. degree. Rao received his Ph.D. in 1948 and the Sc.D. degree of Cambridge University in 1965 by peer review of published work. He was made an Honorary Life Fellow of Kings College Cambridge, in 1974. Rao returned from Cambridge to ISI in 1948 and initiated a Ph.D. program in theoretical statistics and probability for the first time in India and developed numerous educational and training programs in statistics. He guided 50 students for Ph.D. degree. He “single-handedly created an internationally renowned team of young statisticians, economists, and mathematicians who are currently holding prominent positions in several universities all over the world.” Rao also trained statistical personnel to work in government and private organizations in India. He started the Statistical Olympiad program, the first in the world to encourage the study of statistics. Rao has also made considerable efforts to spread statistical education and knowledge in Asian countries. He is currently the Chairman of the International Statistical Education Center established in ISI, to train statisticians from developing countries outside India. “C.R. Rao is a great name from the golden age of statistics. His work was done in India and his intellect shaped statistics worldwide.” – Julian Champkin, editor, Significance, Journal of Royal Statistical Society, UK, and American Statistical Association, USA, Vol. 8, No. 4, Nov. 2011, 175-178. “C.R. 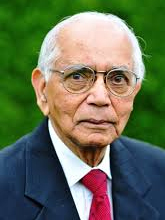 Rao’s research, scholarship, and professional service have had a profound influence on the theory and applications of statistics.” His research career of 70 years in statistics began in the 1940s when statistics was not yet developed and recognized as a separate discipline of study. By virtue of his contributions in a short period of time, “Rao joined the pioneers Fisher, Pearson, Neyman, Hotelling, Wald, and Cramer in establishing statistics as a firmly grounded science.” His first paper published in 1945 at the age of 25 provided a solid foundation to the theory of estimation and resulted in the technical terms, Cramer Rao Bound and RaoBlackwellization, which appear in textbooks on statistics and engineering. The 1945 paper also introduced differential geometry concepts in statistical inference, which led to the technical terms, Rao Distance and Fisher Rao Metric. It opened up a novel paradigm leading to the flourishing field of information geometry. A new test of hypothesis known as Rao’s score test proposed in 1948 appears in books on econometrics. Both these papers are reprinted in the book, Breakthroughs in Statistics: 1989-1990. In another paper published in 1949, Rao introduced Orthogonal Arrays described by Forbes Magazine, 1996, as a new manthrafor industrial experimentation with a large number of factors to design products of good quality. Rao also left an indelible stamp on several other areas of statistics. The Rao’s least squares generalizing Gauss-Markoff theory of least squares, Rao’s U test and MANOVA in multivariate analysis, generalized inverse of a matrix, Fisher-Rao theorem on second order efficiency of estimators, Rao’s Quadratic Entropy, Analysis of Diversity, Rao-Khatri-Kagan-Linnik-Shanbhag theorems on characterization of probability models, and Burbea and Rao divergence measures are some of Rao’s significant contributions. “Government has appointed C.R. Rao, an eminent statistician, as National Professor. Rao is an outstanding and creative thinker in the field. He was appointed by Professor Mahalanobis as a full fledged Professor at ISI at the early age of 29 in recognition of his creativity.” – Government of India Notification. Rao was awarded 37 Honorary Doctorate Degrees from universities in 19 countries, spanning six continents: Europe (10 countries, 11 degrees): Germany, Russia, Switzerland, Poland, Serbia, Spain, Finland, Portugal, Greece, and Cyprus; North America (2 countries, 7 degrees): USA and Canada; South America (2 countries, 2 degrees): Brazil and Peru; Asia (3 countries, 15 degrees): India, Sri Lanka and Philippines; Australia (1 degree), Africa (1 degree). C.R. Rao is the only Asian mentioned in all websites issued by universities in US, UK, and American Statistical Association on founders of Statistics. Rao is the author of 14 books and 475 research papers. He has edited to date 32 volumes of Handbooks of Statistics in different areas of application of statistics to make available the latest methods for use. Rao worked in ISI in various capacities over a period of 40 years (as Head of Research and Training School, Director, Jawaharlal Nehru Professor, and National Professor), until retirement at the mandatory age of 60. After retirement, as there were no opportunities to continue academic work in India, Rao accepted offers of distinguished professorships in USA and worked for another 30 years as University Professor at the University of Pittsburgh and as Eberly Professor of Statistics at Penn State. Currently at the age of 93, Rao has the designation of Research Professor at the University at Buffalo. 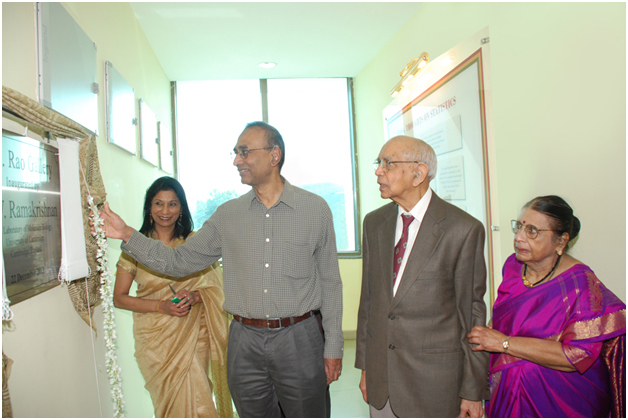 He also serves as advisor to the CR Rao Advanced Institute of Mathematics, Statistics, and Computer Science, housed in the Hyderabad University campus, Hyderabad, India. During his career, Rao has served as President of several international scientific societies including Indian Econometric Society, International Biometric Society, Institute of Mathematical Statistics, U.S.A., and International Statistical Institute, The Netherlands. Dr. V. Ramakrishnan, F.R.S., NL, Kt.